Medium green leaves have wavy, white margins and gray-green streaks at the junction of the margin and center. 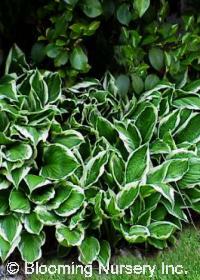 It may lose its variegation during hot summers. Pale lavender flowers appear in midsummer.